Ho, ho, ho! Are you ready for Christmas? I've almost got my sleigh ready, and the elves are putting the finishing touches on the toys. The reindeer are pacing back and forth, so eager to take to the skies! I heard that you want to know more about how I get all around the world in one night, and where I am at which times. I just love a curious, young mind! You are such a smart thinker. 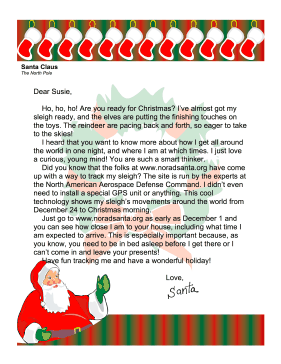 Did you know that the folks at www.noradsanta.org have come up with a way to track my sleigh? The site is run by the experts at the North American Aerospace Defense Command. I didn't even need to install a special GPS unit or anything. This cool technology shows my sleigh's movements around the world from December 24 to Christmas morning. Just go to www.noradsanta.org as early as December 1 and you can see how close I am to your house, including what time I am expected to arrive. This is especially important because, as you know, you need to be in bed asleep before I get there or I can't come in and leave your presents! Have fun tracking me and have a wonderful holiday!